It was already well past midnight. No one was around. There was only me, standing alone in a city square said to reflect the “Image of the World”, in a city, which according to a Persian proverb, called “Half of the World”. I walked around for a bit and noted Ali Qapu Palace on one side while another smaller-but-no-less-grand masjid, Masjid Sheikh Lotf Allah on the other. Located on opposite sides, both of them, along with Masjid Imam and Imperial Bazaar which occupy the other two sides, are connected to each other via the long row of shops making up the souq. And the four of them together, form Naqsh-e Jahan Square, or what is now more well known as Imam Square. This was all done by design, of course. 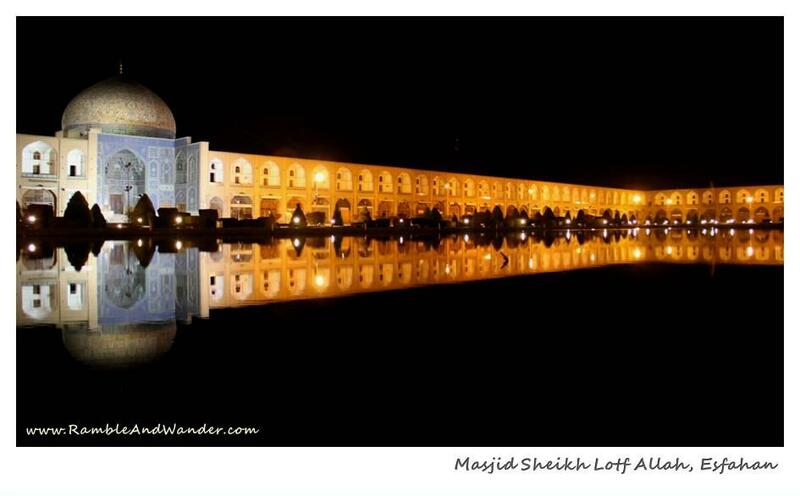 The guy behind this was Shah Abbas, who moved the capital of Safavid Dynasty to Esfahan. He wanted a place in his then new capital. A place to gather the people, including the three main powers that made up and controlled the city – the clergy, the traders, and he himself as the Shah. Alone, I reflected more and more, just like the endless reflection of these buildings on the water. My thoughts rambled. My mind wandered back and forth. My eyes tried to take in every single detail of the beauty that surrounded me. My soul enjoyed the solitude. How I just love Esfahan.